I did not expect so much feedback about socks! You guys gave me so many good ideas and resources. I am more psyched than ever about this New Year's goal. As Barb said, that is the power of socks. So here they are: My Favorite Graynbow Socks, knit for the Christmas Eve Cast On with sweet Dani of Little Bobbins Knits. They're also my first completed project of 2016. 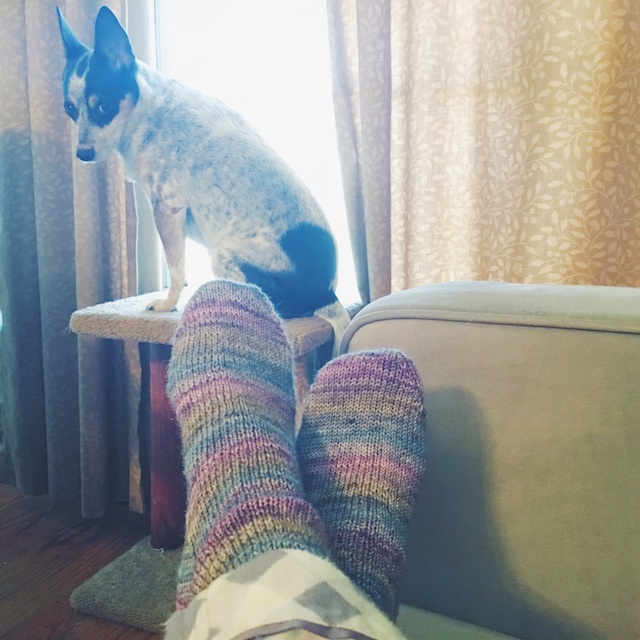 This is my third pair of socks to knit, but my first to knit mindfully. 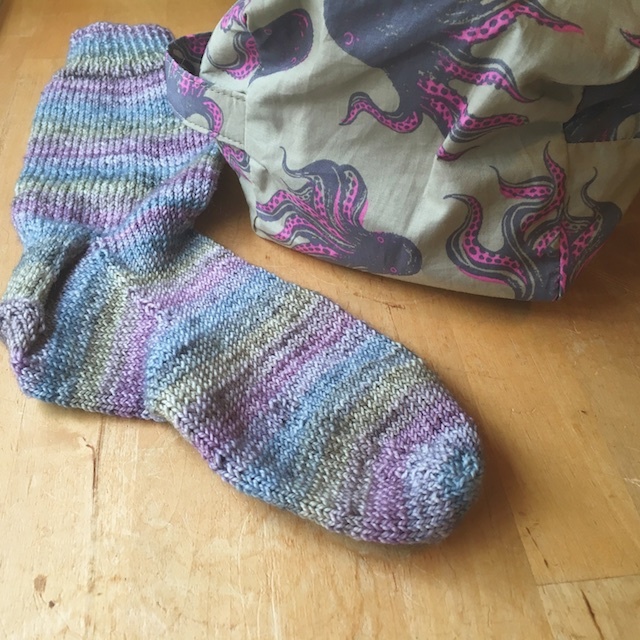 I took Lara's, of The Fawn Knits Podcast, advice and used the Voolenvine Favorite Sock pattern as a good starting point for beginners. It is a good, straight forward cuff-down sock pattern. Very classic. The details: I tried casting on larger, but 56 stitches definitely worked better for me. I knit loosely and I have narrow feet, but knitting with size US1 needles at 7.5 to 8 stitches per inch seemed to fit well. From gusset to toe decreases, I knit 3 7/8". Now, I 've been warned (like in the comments of my last post. Thanks, Heather) I should have negative ease. I'm not certain that I achieved that. There's that little bunch of fabric in front of my ankle; however, that might be because I'm leaning forward and doing gymnastics to get a photo of my own legs. 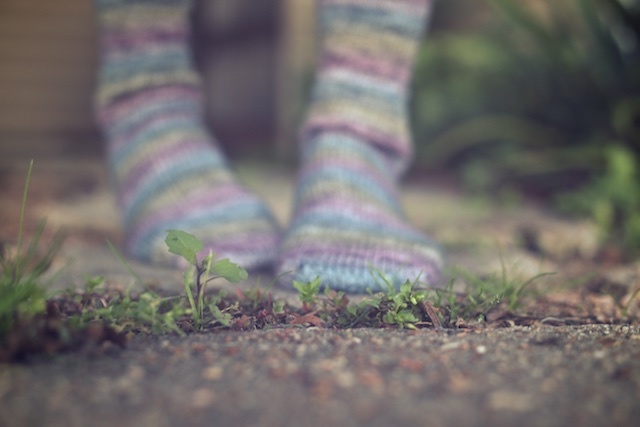 I'm also not sure if super wash socks, knit at such a tiny gauge will grow on me like some super wash sweaters have. I suppose the true test will be the first washing and blocking. I finally ordered some sock blockers for the occasion. I almost kept my striping even for both socks but I think switching back to English style on the second sock, and somehow finally getting my hands to knit the gauge tightly without strain, gave me a slightly smaller sock. It's only the toe that is different, so I'm really pleased. I knit these with a longer leg because I enjoyed watching the colors stripe so much, but I think I prefer socks either lower or much higher. For knee socks, I think I'd have to do toe-up socks, though. 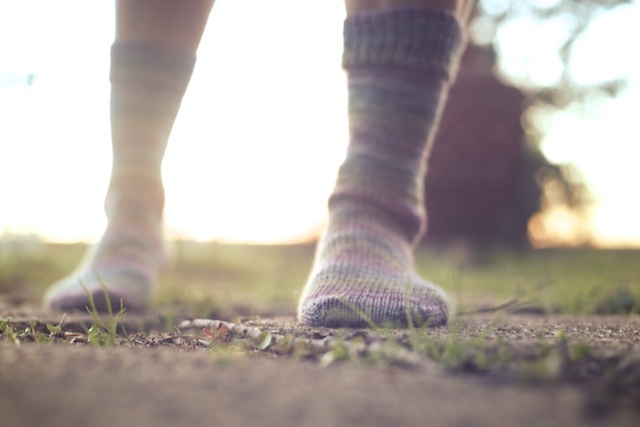 My Tennessee Hiking Socks were knit that way so I could feel confident I wouldn't run out of yarn. 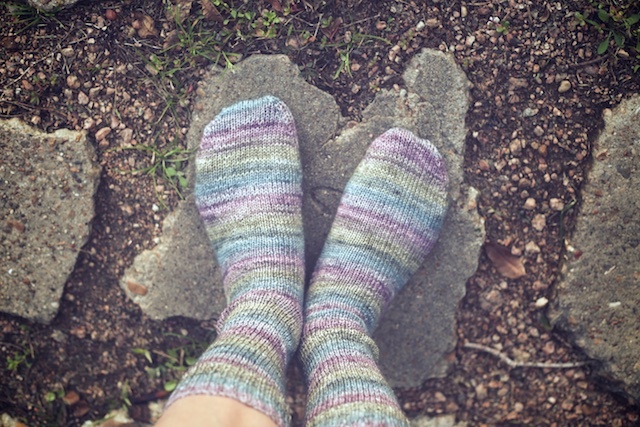 Gynx Strong Sock is as lovely to work with as Laura's other yarn bases. I am hopeful it will stand up to much wear. Next time: I want to use a 2x2 rib for the cuff. I may move to a size 0 needle (yuck) if these grow after washing because I cannot knit any tighter than this and I want a good, solid fabric. Also, I noticed the toe of some of my winter socks wears thin. So I would like to try reinforcing both heels and toes with thread or yarn. I saw an idea I liked from VeryPink Knits, using sock thread. This wouldn't make things too cramped in my shoes and would certainly add to my sock longevity. But, I'm not sure I'll get around to buying said thread before I'm ready to cast on my next pair. 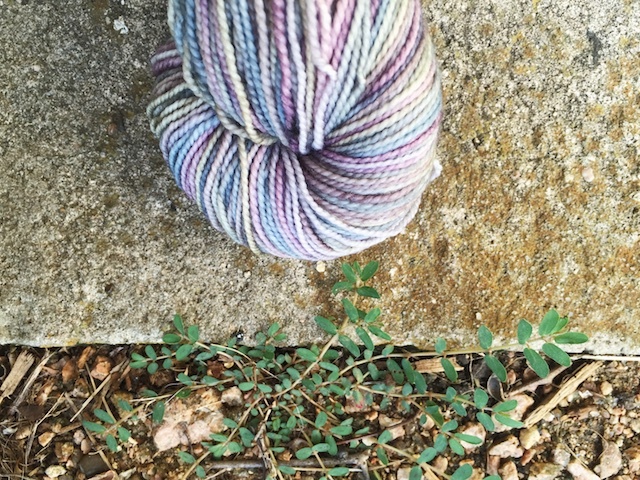 If nothing else, I could substitute a very sturdy workhorse yarn for contrast toes and heels when using a somewhat delicate sock yarn. I really like that look anyway. 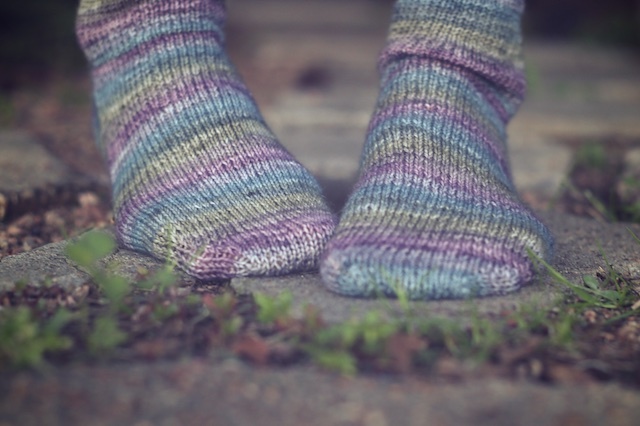 I think I'll follow Katie's lead, also from my last post, and try a pair of toe-up, two at a time socks, just to get another pair out there quickly. I might make them longer to take advantage of the whole toe-up thing. My favorites list, which is what I plan my upcoming knits from, grew big time after all of your thoughtful comments on that last post. 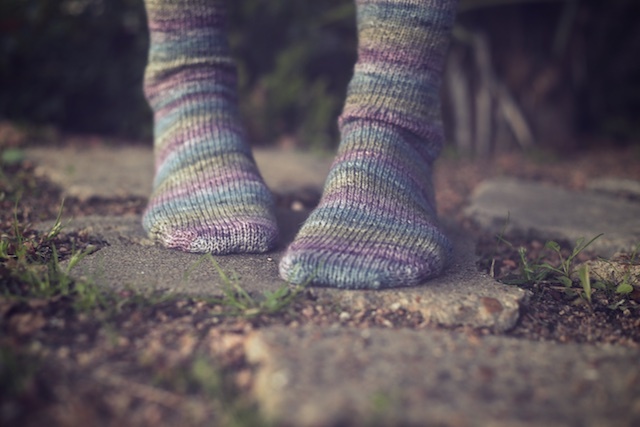 Between those and suggestions I've seen in the Little Bobbins Christmas Eve Socks thread, I could knit socks for years without stopping to take a breath. Of course, I'm a sweater knitter at heart, so I won't be doing that. I will be using them to fill in between larger projects and for something handy to have in my bag.